Thousands of bridges in the United States are in danger of collapsing because their structures are outdates or have been poory built. The Huffington Post reports that states and municipalities have made efforts to repair bridges which are “structurally deficient,” meaning that a significant portion of the bridge is in poor condition, but have been hampered by a lack of funds and a backlog of repair work. The Federal Highway Administration says there are currently 66,749 structurally deficient bridges and 84,748 functionally obsolete bridges in the United States, including Puerto Rico. Mark Rosenker, former chairman of the National Transportation Safety Board, says that after the I-35W Bridge collapse in Minneapolis in 2007, the board examined whether other fracture critical bridges were collapsing, and found a few cases, but not many. “Today, they’re still building fracture critical bridges with the belief that they’re not going break,” Rosenker told the Post. The Federal Highway Trust Fund, which provides construction aid to states, gets the majority of its revenue through federal gas and diesel taxes. This funding has declined significantly in recent years, however, because more people are driving more fuel-efficient cars. Barry LePatner, who wrote the book Too Big to Fall: America’s Failing Infrastructure and the Way Forward, says fracture critical bridges in the United States are the result of Congress trying to save money. “They have been left hanging with little maintenance for four decades now,” LePatner told the Post. “There is little political will and less political leadership to commit the tens of billions of dollars needed” to fix them. The federal gas tax had not been increased since 1993. Some lawmakers have proposed a new tax, based on how far a person travels in his or her car, but concerns about privacy have so far prevented serious consideration of this proposal. Spending on transportation were boosted by the economic stimulus package, but only $3 billion of the $27 billion designated for highway projects went to upgrade bridges, according to Alison Black, the chief economist for the American Road and Transportation Builders Association (ARTBA). 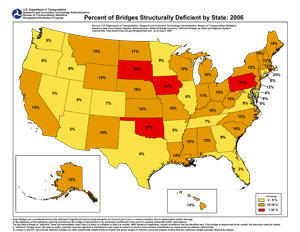 States now realize that they will not receive much federal help to upgrade their bridges. The ARTBA says that spending by states and local governments on bridge construction has increased significantly, from $12.3 billion in 1998 to $28.5 billion last year.